Susan Beth Pfeffer's Life as We Knew It enthralled and devastated readers with its brutal but hopeful look at an apocalyptic event, an asteroid hitting the moon, setting off a tailspin of horrific climate changes. Now this harrowing companion novel examines the same events as they unfold in New York City, revealed through the eyes of seventeen-year-old Puerto Rican Alex Morales. When Alex's parents disappear in the aftermath of tidal waves, he must care for his two younger sisters, even as Manhattan becomes a deadly wasteland, and food and aid dwindle. It was a night like any other for seventeen year old Alex, his mother has been called to the hospital for an emergency and his father is away attending his mother's funeral, so when his uncle frantically wakes the household in the middle of the night, there seems to be more to the electrical power outage than Alex first thought. New York, the city that never sleeps, is now on the verge of mayhem. The initial reports alerting citizens of meteor that collided with the moon, had knocked the moon from it's orbit. With very little money, both parents absent and his brother being deployed on Marine duty, it is Alex's responsibility to care for younger sister's Julie and Briana. Luckily the siblings have enough canned goods to last for the next few weeks and surely New York will be bustling by then. But the devastation has only begun. With the bodies of the dead lining the desolate streets, looting, rioting and rising tides, Alex begins to question God and his devout family's religious beliefs. He needs to fight for the survival of his family. Manhattan has been decimated, with tides twenty feet tall sweeping away citizens and buildings, an enforced curfew, mandatory evacuations, plane crashes and countless dead throughout the subway due to flooding. Alex is beginning to believe that his mother may not be coming home, and his father swept away in the tiny coastal town in Puerto Rico. In order to survive, Alex sends sister Bri to a convent in the countryside, believing that she'll be well taken care of and will survive long after he is suffering from malnutrition and starvation, unless the riotous streets take his life first. But he has Julie to care for, at only twelve, she doesn't have the luxury of a convent. Because anywhere with enough food is a luxury nowadays. At least the two siblings have school, forced to work for their measly lunch and eating supper every other night. But it isn't enough. When the air is thick with choking volcanic ash, the small amounts of food being rationed are dwindling and the crops have long since died, Alex has no other choice and begins to steal and loot from the dead. May God forgive him, but he needs to survive and money is of no use to the world now. The barter system is in place, and shoes, winter coasts and luxury items are big business and can be exchanged for food. It's far from honest, but God will forgive him at adapting to survive. Sister Briana arrives home, as the convent can no longer feed the intake of girls, and with chronic asthma, she is forced to stay indoors. But when the blizzard conditions arrive, no more food drives, nothing left to barter and the world is now deserted, Alex will do just about anything to free his siblings of the apocalyptic and deadly New York. But when illness starts to spread, will any of them survive? 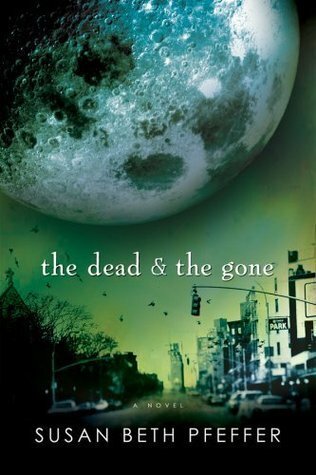 The Dead And The Gone tells the story of the the moon meteorite, from Alex's point of view, living in New York. It doesn't retrace the natural disasters from the first in the series, Life As We Knew It, but rather how survival is measured through the eyes of Alex, the intelligent Puerto Rican New Yorker. Alex and his siblings turn to religion in the face of loss and devastation, and attend Catholic school's within the area. Alex struggles with now being the caregiver and provider to two younger siblings, and his ideals can be awry in some instances, if not delusional. Not as terrifying or strangely captivating as Life As We Knew It, but it's somewhat entertaining. The characters just weren't engaging and their scenario was more over dramatised than dire at times. I'm hoping the third book offers redemption.